Depending on where you are in Clark County, and in at least one case depending on what side of the road you’re standing on, the law as it applies to fireworks can be different, and the resulting patchwork nature of regulations can be confusing. In Vancouver, they’re banned altogether. 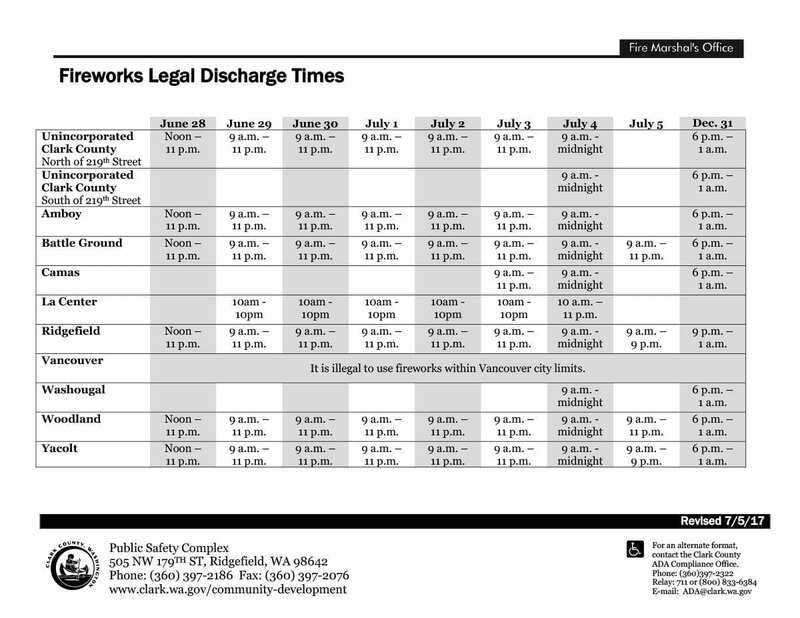 In Clark County, there are two sets of rules for areas on each side of Northeast 219th Street, where to the north they are allowed June 28 to July 4 and on New Years Eve. Some municipalities further from the urban center of the county have no laws beyond existing state regulations to speak of while others range anywhere from one to seven days of allowable sales. Boldt, fellow county councilors and the Clark County fire marshal met at the Public Service Center in Vancouver Tuesday to discuss fireworks and what can be done to reduce the risk of damage as well as the amount of garbage and the noise the explosives bring as America celebrates its independence each year. In doing so, the council hopes to also alleviate the confusion of residents and consumers. The session began with an overview of recent stakeholder meetings by Fire Marshal Jon Dunaway, who has discussed the matter with residents, county staff, retailers and others. By the end of the work session Tuesday, the council — with the vocal exception of councilor Julie Olson — seemed to be in agreement in asking staff to deliver recommendations that would allow for four days for the sale of fireworks and two days for residents to ignite them. Additionally, county workers were asked for recommendations for increasing enforcement of the law as it applies to fireworks and to further explore the possibility of additional fees at the point of sale and in the permitting process to help cover the extra costs. Fire Marshal Jon Dunaway was also asked to create a proposal that would allow him to call for a ban on fireworks similar to what the county does with fires in the case of an extended dry spell or heat wave. There was no clear direction from the council on banning certain types of fireworks, a so-called “safe and sane” policy similar to what’s in place in Washougal where all fireworks that travel more than one foot in the air, and many others, are prohibited. Creating a cohesive policy that expands beyond unincorporated Clark County and into other cities appeared to be the primary focus for Boldt and others on the council. Battle Ground is poised to vote on a similar policy allowing four days for sale and two days for use of fireworks after holding a public hearing on the matter Monday night. Boldt mentioned Ridgefield and La Center as two other cities he believes might follow suit, bringing a significant area of the county under the same set of rules when it comes to fireworks. La Center City Councilor Doug Boff, who was in attendance, said after the session he believes the council will support four days of sales and two days for use of fireworks. A caveat is that he would like to see at least two of the days for fireworks sales fall on a weekend when those who sell them often see the most traffic. In the case of La Center, the sole provider of fireworks in the city is the Lions Club, he said, and the nonprofit group uses its earnings to perform positive work in the community. That point was one made repeatedly by Councilor Eileen Quiring, who advocated for a recommendation that would allow for the sale of fireworks on a weekend before July 4, though the prospects of such a rule would be made tricky by the changing nature of the calendar year. Olson, the only member of the council to speak in favor of tighter regulations for fireworks in Clark County beyond what Boldt requested, said she would like more options for the council to consider, including some that further restrict fireworks. “I think two’s too many,” she said of the proposed number of days fireworks would be allowed under Boldt’s plan. At several points in the meeting, Olson, whose own house was damaged by fireworks last year, spoke in favor of protecting those who fear fireworks due to possible fire danger, noise, garbage and other issues the explosives create. 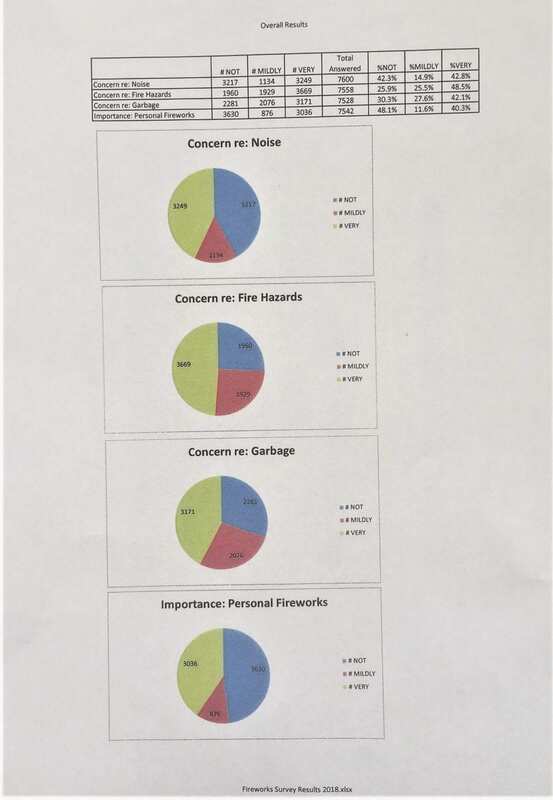 While stressing that she doesn’t dislike fireworks or the people who enjoy them, and she doesn’t want to ban them completely, she said she was “trying to be creative” in reaching a solution that doesn’t ignore the concerns of thousands of people who took part in the survey and have made complaints. Olson said allowing for the sale on weekends regardless of where the Fourth of July falls in the week would create more confusion, not less as other councilors desire, and that allowing for two days of fireworks use does nothing to combat the problems. 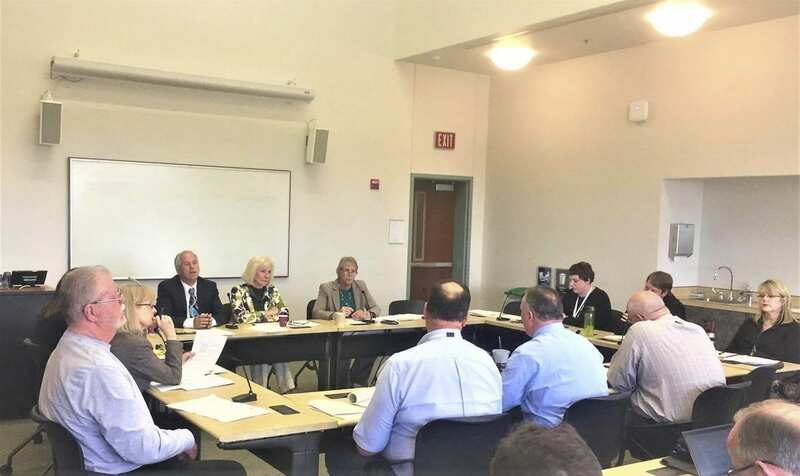 She lamented the course of the council and said their job is to help constituents, mentioning the plight of a north Clark County resident who earlier in the morning testified about a large honey bee operation that is damaging his property and putting his children in harm’s way. She said the council would help him, and others facing separate but similar issues, but that there seems to be an ongoing reluctance to assist those who are afflicted in some way by fireworks. “When people come to us on this (topic), we don’t help them,” she said. Olson said residents expect the council to respond to their concerns. 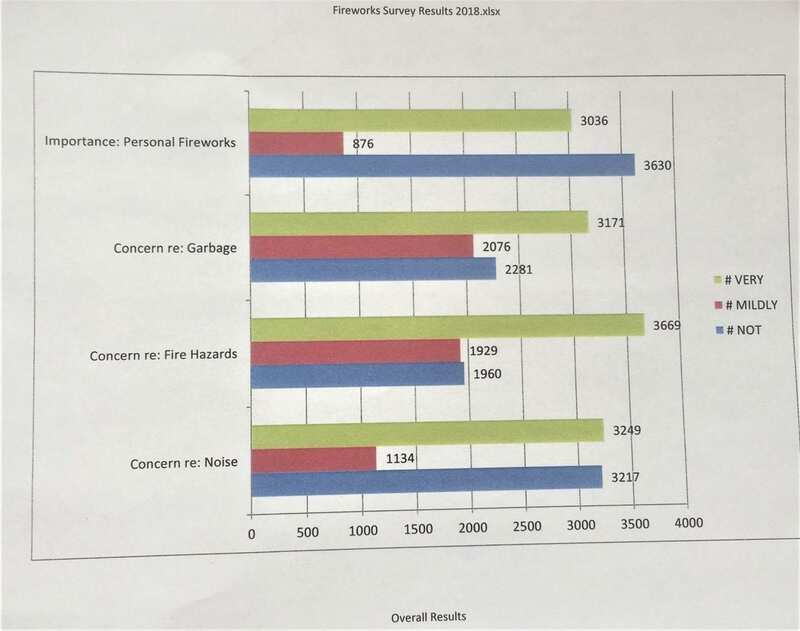 “Going two days is not going to fix this,” she said, holding up a pile of papers that appeared to be complaints, input and survey results from residents. For the most part, though, the remaining councilors — aside from John Blom, who was absent — seemed to be on the same page. Councilor Jeanne Stewart, leaning on past experiences with the city of Vancouver, advised her fellow councilors that increasing enforcement, as is being requested, is a “dual-edged sword.” When residents hear that authorities are increasing enforcement, they’re all the more frustrated when fireworks continue to be used as officers are given the impossible task of policing the problem out of existence. Like Quiring, Stewart also expressed hope that fireworks stands will be able to conduct their business on weekends under whatever new arrangement is eventually passed by the council. She said the overwhelming amount of input provided through the survey show how interested the community is in the topic, not necessarily that there are more opposed or in favor of new regulations. Quiring said “still allowing people to celebrate our independence” is important. Outside the Public Service Center, Clark County fireworks retailer Gene Marlow reacted with frustration with how the council is approaching the issue. Marlow noted that retailers themselves proposed a fee at the point of sale and a $150 tent permitting fee in order to help the county enforce fireworks laws. Likewise, he said retailers can educate buyers on where fireworks are legal to use and where they are not. He predicts that any changes the council makes to the law will only serve to make the situation more dangerous, especially as he expects the Cowlitz reservation to eventually be home to the sale of much larger fireworks that are illegal under state law. Since local fireworks sales also contribute toward Vancouver’s annual fireworks show at Fort Vancouver, the course of the council could eventually threaten the existence of a community tradition, especially since Vancouver has already banned fireworks, Marlow said. “If the majority of people didn’t want to do fireworks on the Fourth of July, you wouldn’t see them going off as much as they do,” Marlow said. A public hearing will be scheduled on the recommendations currently being produced by the fire marshal and county staff.